Deafeningly loud rock music has lost one of its founding fathers. 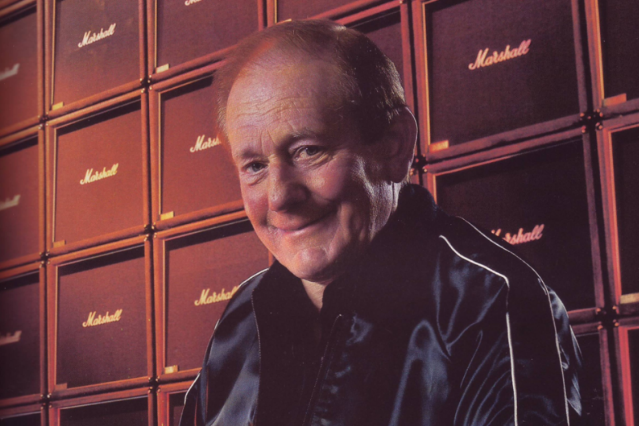 Jim Marshall, whose Marshall guitar amplifier helped multiple generations of rock legends crank their sound to 11, is dead at age 88, according to a statement from the company he founded. Marshall’s amps generated a powerfully fuzzy blast that became omnipresent among ’60s rockers. Jimi Hendrix, Eric Clapton, the Who’s Pete Townshend, Black Sabbath’s Tony Iommi, and Led Zeppelin’s Jimmy Page all used Marshall amps, as the Wall Street Journal notes. But so did AC/DC’s Angus Young, Guns N’ Roses’ Slash, Van Halen’s Eddie Valen, and, further demonstrating Marshall’s multi-generational reach, Nirvana’s Kurt Cobain. Our current cover stars Sleigh Bells perform before a small tower of Marshall stacks. Marshall’s son Terry Marshall told the Associated Press his father died yesterday after suffering from cancer and several strokes. The amp pioneer engaged in various charitable causes, and Queen Elizabeth II named him an Officer of the Order of the British Empire in 2003 in recognition of his exporting of British goods as well as his charitable work. Along with two children and two stepchildren, he is survived by grandchildren and great-grandchildren.